Water, cracked grain and hops flowers from the hop vine. Three essential ingredients make the base of any beer. Add yeast and time, and your alcoholic beverage is ready. For this shot I used the exact same lighting set up as the previous entry, but took two exposures for the final. 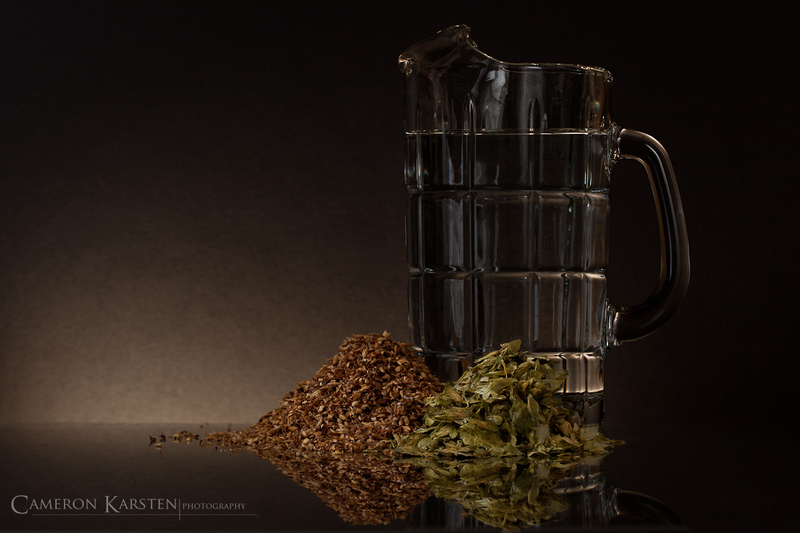 One for critical focus on the dried hops and cracked grain, and another for the water pitcher. In PS5 I combine the two images with layers and masks for the final cut. 100mm, 1/5 sec at f/10, ISO 100, tripod mount. Wow! Great photo! I’m a WordPress photographer as well, so I love seeing posts like this! Keep up the good work! I like this image a lot. This reminds me, I have a beer brewing Christmas gift I have not used yet.